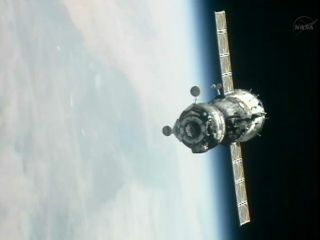 The Russian Soyuz TMA-06M spacecraft as seen from the International Space Station as it approaches on Oct. 25, 2012 for docking. The Soyuz TMA-06M spacecraft docked at the space station's rooftop Poisk module at 8:29 a.m. EDT (1229 GMT) after a two-day orbital chase. Riding on the Soyuz were American astronaut Kevin Ford of NASA and Russian cosmonauts Oleg Novitskiy and Evgeny Tarelkin, who are beginning a five-month mission to the space station. "We can see you, everything looks fine," Russian cosmonaut Yuri Malenchenko, who was already onboard the station, told the approaching crew before the two spacecraft docked about 230 miles (370 km) over southern Ukraine. The Soyuz crew will float inside the space station at about 11:15 a.m. EDT (1415 GMT) during a cosmic welcome ceremony.You can watch the Soyuz crew's welcome ceremony live on SPACE.com here via a NASA TV feed. The NASA broadcast will begin at 10:45 a.m. EDT (1445 GMT). "We’ll stay until March," Ford said in a NASA interview before launch. "We’ve got some space station maintenance activities planned, some kind of periodic maintenance that we’ve trained for, but really the emphasis will be on getting the science rolling and getting as much utilization out of the flight as we can." The Soyuz spacecraft is bringing some fishy friends to the space station in addition to its human crew. The spacecraft is ferrying 32 small medaka fish to the space station so they can be placed inside a tank, called the Aquatic Habitat, for an experiment to study how fish adapt to weightlessness.